A long time ago the eyes of our Great-Great-Grand Parents were able to see all of the objects up to the line of a horizon. Unfortunately, our technological era of tall buildings, high density, TV's and computers have tremendously limited this ability. And our eyes almost lost this greatest way of natural vision relaxation. We do not even notice when our eyes stop moving and we do not even know how to relax them. We think that we are relaxing when we are in front of the TV, but it is an illusion. We just add up the stress to our own precious eyes. This is the most important point in any eye exercising routines. We have to learn how to relax our precious eyes in the environment we live in today. Now, let's introduce a few different techniques of eye relaxation. Practice these simple EYE RELAXATION EXERCISES throughout your work day, while you are stopping at the red light, while you are in an elevator, in a subway, while you are standing in a lineup, during a TV commercial, etc. Never begin your eye training with tired eyes. Perform these relaxation exercises before you start your main set of EYE EXERCISES. 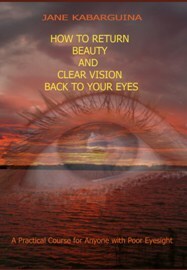 To watch my video on eye relaxation go to Eyesight Improving Relaxation Eye Exercises video. Close your eyes half way down. You will notice that your upper lids constantly tremble with different amplitude. Concentrate your efforts on stopping this trembling. 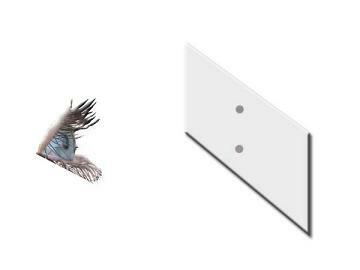 (Little hint – it will be easier to do if you look at further objects). Slowly close your eyes, like your eyelids are made out of puffy cottony clouds. Think that eyes get extremely comfortable in their position. The place behind your eyes is getting warm and feels how the blood filled with the oxygen flows through your eye sockets. When you inhale imagine the breezy oxygenized air coming through your nose into the eyes washing each eye’s blood vessel. Exhale through the mouth. Breathe this way for one or two minutes and end this exercise with a smile. That they are made out of something that is hard to lift….. Please, do not snore if there are other people in the same room. I placed much more Eye Relaxation Techniques throuthout this website, you just need to watch for the picture in the text. You can find them on Palming page and Eye care page.